Cambodia has risen from the clouds of its dark past to become one of the best travel destinations in Asia. While the stunning Angkor Wat temple — the largest religious complex on earth — is the jewel in Cambodia’s crown, there is much more to do. One of the top places to visit in Cambodia is Siem Reap, the bustling town nestled near the Angkor Temples complex. 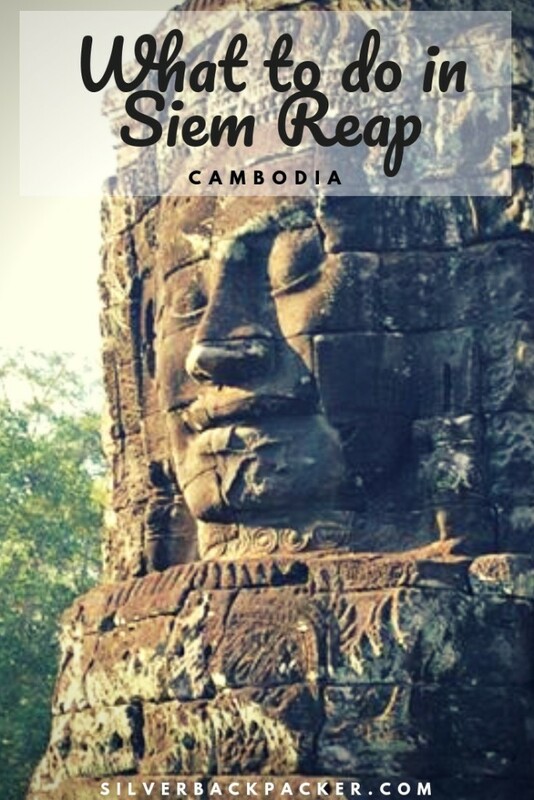 Most people who visit Cambodia will find themselves in Siem Reap at some stage, and many will only stay for a couple of days while visiting the temples. 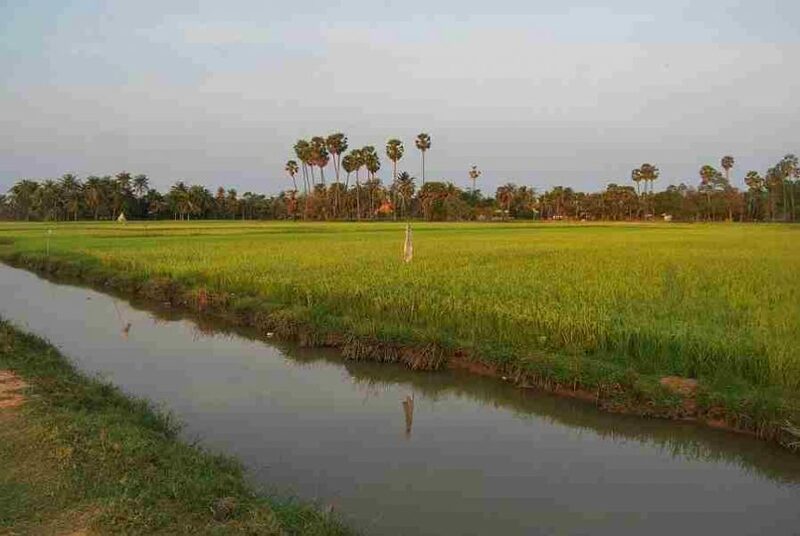 However, there is much more to do in Siem Reap as well. Here are some of my favourite things to do in Siem Reap, Cambodia. Of course, you can’t leave Siem Reap without visiting Angkor Wat. 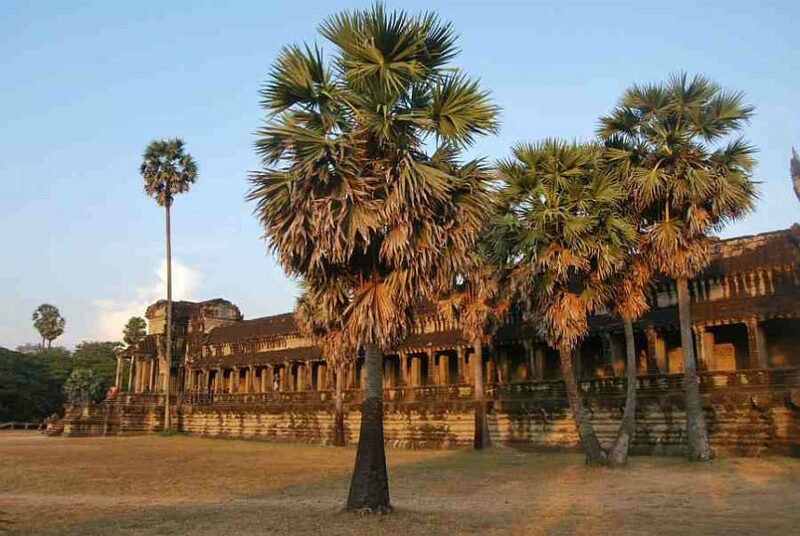 It’s hard to understate this huge, ancient temple’s significance to Cambodian people and their culture. Not only is it a huge source of national pride (it even features on the flag of Cambodia), but it is also a place of great spiritual significance to the Buddhist majority. In fact, part of what makes it such a magical place to visit in the sight of Monks in their saffron robes walking through the corridors. The best time to see Angkor Wat is undoubtedly at sunrise. By the mid-morning, crowds will have swelled and the temperatures are sweltering. By contrast, there is only a scattering of people at dawn, and the sight of the golden light rising over the temple is truly magical. Plus, the temperature is a little more bearable! There’s a fairly well-trodden route for seeing the temples. Along with Angkor Wat, most visitors then head on to visit the Bayon and Ta Prohm, the next most famous temples in Cambodia. It’s well worth jostling with the crowds to experience these two temples, although again, the crowds are better if you go during low season or early in the morning. Ta Prohm is famously known as the backdrop for the movie Tomb Raider, and it’s totally charming. Unlike the other well-restored temples, Ta Prohm is overgrown, with tree roots intertwined with fallen bricks and stone. 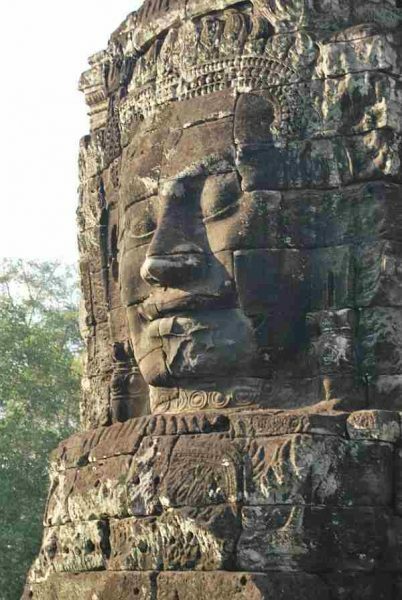 The Bayon is equally mesmerising, with its huge Buddhist faces that seem to follow you with their eyes, wherever you go. A lot of tourists check off Angkor Wat, the Bayon and Ta Prohm and then head on their way. By doing so, they miss the opportunity to see the ancient temples without the overwhelming crowds. There are dozens of other temples that receive hardly any visitors at all, meaning you will have all the time in the world to explore them. Banteay Srei is one of the more well-known temples, although it receives nowhere near the foot traffic of the others mentioned. It’s also a beautiful drive through modest villages to arrive at the the intricate temple. Another favourite of mine is Pre Rup, which is very beautiful and yet seems almost completely undiscovered (for now!). I like the Night Market because there’s a little more variety than some of the day markets in Siem Reap. Rather than just the usual mass-produced souvenirs, you can also find beautiful recycled notebooks, passport covers and bags from the NGO Friends International, some unique and beautiful artwork including paintings and photographs (look towards the back of the market) and gorgeous kids’ toys from another great NGO, Human and Hope Association. 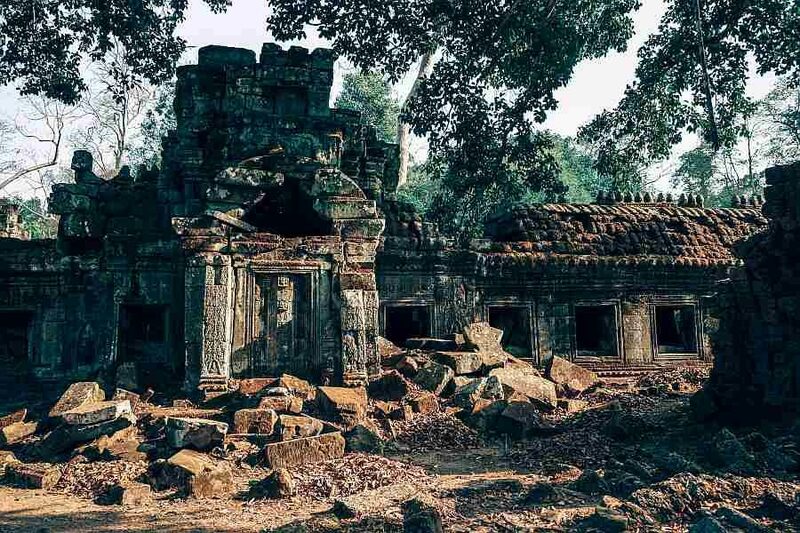 Siem Reap — and much of Cambodia — has such a positive and upbeat vibe, that it’s sometimes easy to forget that that the country was utterly devastated by the Khmer Rouge era in the 1970s. Under the brutal dictator Pol Pot, more than a quarter of the population perished and nearly every Cambodian family knows victims. Landmines are another hangover from this time. Unfortunately, Cambodia continues to see the impact of this, and many people (including children) are killed or maimed every year by landmines. One site that helps you truly appreciate the impact of this is the landmine museum. It has an interesting collection of military objects, and employs those who have been affected by landmines as tour guides. It is a moving and humbling experience that really brings home the difficulties still faced in Cambodia. Siem Reap is landlocked, but you can experience a unique “beach” experience at West Baray, a popular local’s hangout just out of town. Overlooking an estuary, West Baray is a sort of manmade beach with some sand and plenty of hammocks. Simply pay over $1, and you can laze there all afternoon. Expect to periodically be offered drinks and snacks, which only adds to the experience. I love spending relaxing afternoons at West Baray, especially after a big day of exploring the temples. Not only is it fun and relaxing, but it’s a great way to meet locals and find out more about every day life in Siem Reap and Cambodia. Most Cambodian people are Buddhist, so Wats and Pagodas can be found all around the outskirts of Siem Reap. They are really beautiful, often with classic Siamese architecture and beautiful paintings as well. If you are lucky, you might even get to chat away with some Buddhist monks, who are often keen to practise their English and share some local knowledge. There are many beautiful pagodas near Siem Reap, and it’s also great to get a tuk-tuk there so you can pass through the small villages along the way. Some of the most beautiful are Wat Damnak Pagoda and Wat Preah Prom Rath — just make sure you cover your shoulders and knees, take your shoes off at the door, and bring some small notes for a donation (it’s not usually compulsory, but it is appreciated). If you’re looking for something unusual to do in Siem Reap, and you’ve got a strong stomach, then you have to heat out to “Sixty Street” (also known as ‘Sixty Road’), another popular local haunt that is well and truly off of the itinerary for most travellers. 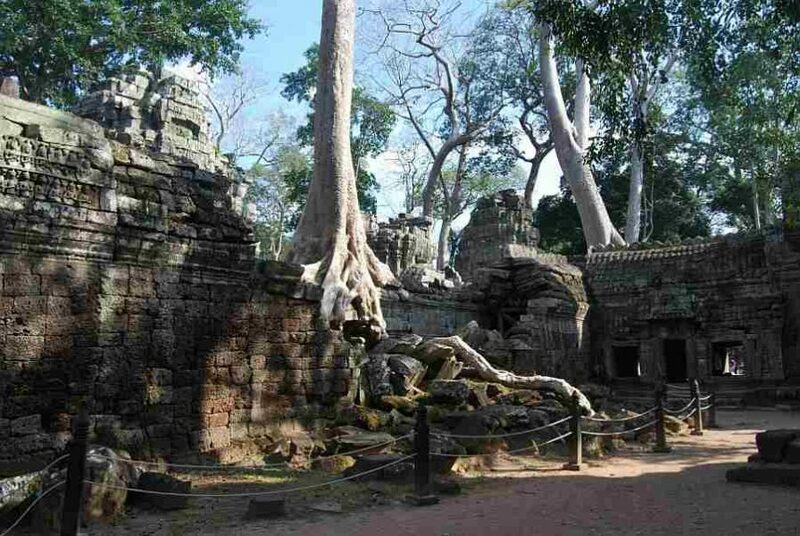 That’s a shame, because it’s one of my favourite places to visit in Siem Reap! A bit like West Baray, for a small fee (less than $1) you can rent a picnic blanket to enjoy a feast of local street food. There are many sellers with all kinds of meals. Some are a little more usual (like chicken skewers), but you can also find a dazzling array of dishes including grasshoppers, cockroaches, snakes and frogs. It’s not for the faint-of-heart, but it’s quite the experience! For something a tad more luxurious than eating grasshoppers, I love Scenteurs d’Angkor, a great company that produces beautiful skin care products and spices near Siem Reap. You can go on a tour to find out more about how they produce all of their products, and then there’s a nice gift shop at the end. You’re not obliged to buy anything, but the prices are great and so is the quality. I also like Scenteurs d’Angkor because they employ many socially disadvantaged people, such as people with disabilities or single mothers. They pay people fairly and ensure that everyone enjoys safe working conditions — this means that you can definitely treat yourself to a nice moment of your time in Siem Reap, without having to feel too guilty! The infamous Pub Street in Siem Reap wakes up around mid-morning and doesn’t sleep until the sun is rising again. If you’re looking to experience Siem Reap’s nightlife along with many other travellers and especially backpackers, then Pub Street is the place to go. It’s definitely not a local’s haunt however bars like the Temple Bar and Angkor What?! are a lot of fun. That said, you definitely don’t have to have a wild night on Pub Street. There are actually lots of different restaurants selling everything from traditional Khmer Cuisine to French and Mexican. If you are looking to have a more upscale (but still super affordable) meal in Siem Reap, this is the place to go. You can even do a cooking class to learn some of the tips and, if you’re lucky, hear some stories from the staff who know Angelina Jolie (Le Papier Tigre was apparently one of her favourite places while in Cambodia). So, there you go! Ten different things that you can do in Siem Reap in Cambodia. I really love Siem Reap — in fact, I’ve visited three times, and on each one I’ve had a great time. Although at first it might seem like your typical “tourist town”, if you scratch the surface just a little, you will find it’s got a lot more soul than many people give it credit for. 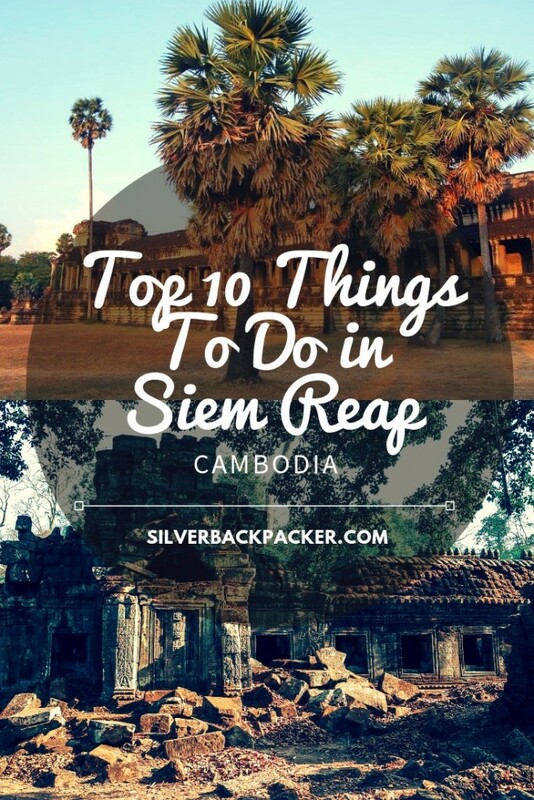 Did you like “10 Fun Things to Do in Siem Reap, Cambodia” ? If so then please share this page with your friends.